Do you fancy a dance with these graceful giants? It is the time of the year again were diving and snorkelling in the Lhaviyani Atoll is special in itself, yet when manta rays start to regularly appear at the cleaning station, our happiness borders on mania! The place to be is one of the top 5 Prodivers sites situated in the Lhaviyani Atoll. Several Mantas frequently visit the dive site to have their bodies cleaned, and the plankton-rich areas at nearby reefs provided what appeared a tasty soup that dozens of Manta Rays satiated their hunger with. On this magnificent spot, Manta Rays can spend hours as they hover above the reef and enjoy a beauty and well-being treatment after their bowls of plankton soup. This fantastic location offers unforgettable underwater experiences to divers and snorkelers alike. For the best viewing pleasure, you’ll have to hop on one of our diving and snorkelling manta search boats. Join us for these breath taking moments! There aren’t many holiday destinations that are as synonymous with luxury as the Maldives. Mention the country and you immediately evoke images of glamourous resorts on private islands catering to the world’s rich and famous. Heavenly exotic? Check. Prohibitively expensive? Double check. For most, the Maldives is either a once-in-a-lifetime honeymoon destination or simply relegated to the bottom of an unrealistic bucket list. And although many divers drool over the diversity of the coral reefs and marine wildlife in the country’s waters, many assume that the destination is just simply out of their price range, especially those not looking to join a liveaboard. And until 2011, that assumption would have been a fair one. Because until then, Maldivian law dictated that there be a strict divide between islands that welcomed tourists, and islands where locals lived. This set up was in large part due to the 100% Muslim country being under a mix of common and sharia law. Whereas in local islands, alcohol and pork are banned and modest clothing traditions are followed, none of these laws apply in resort islands. So until five years ago, tourists would fly into the country, be greeted at the airport and then whisked off to their private resort island. They would remain there for the entirety of their stay (bar excursions) and local Maldivians continued to live on their inhabited islands. And never the twain did meet. But no longer. In 2011, the law officially changed to allow for tourist establishments in local islands, and while the same laws still apply, the increasing number of tourist arrivals to these islands each month show that visitors are happy to go without a bevvy or bacon butty for a week or two. For the past five years, these local island guesthouses have been cropping up throughout the country at an extraordinary rate. And although they’ll never be comparable to the backpacker prices of other parts of South East Asia, the rates are extremely competitive relative to the resort market, with some charging as little as 40$ per room per night. Naturally, the quality you’ll find varies from place to place but although these local islands establishments are referred to collectively as ‘guesthouses’ in the Maldivian tourism industry, some would be better described as boutique hotels, with spacious rooms, in-house restaurants serving top-notch food, and a handful even have their own pools. So why is this relevant for divers? 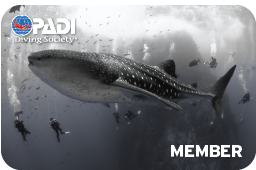 Well, thanks to the influx of tourists, most of these islands are now home to a PADI dive centre, and in some cases (such as guesthouse-capital Maafushi Island) there are several. Many of the guys running these centres have had years of experience in the resort industry, meaning that the service is of a high standard. Dive rates tend to be cheaper than in the resorts too, so if you’re on a tight budget it’s a great option. Most centres dive with traditional Maldivian dhoni boats so the level of comfort is similar – and of course the dive sites are the same regardless of how much you’ve paid to get there! Why not just join a liveaboard? True. Before the advent of the guesthouse industry, divers looking to spend the majority of their budget on diving had to join a liveaboard cruise. Which is fantastic if you and your spouse are both divers. But a non-diver on a diving liveaboard? They’d soon understand the meaning of cabin fever. This is why a local island stay is a fantastic choice for budget-conscious divers looking to travel with a non-diver. Whilst in some resorts snorkelers and divers normally join separate excursion boats, in local islands both tend to go out together because operations are smaller. This means that you’re not away from your loved one for very long – you can enjoy the cruise there together, looking out for dolphins, enjoying the sun (bliss!) – but when you reach the dive site, you can descend for your dive whilst your non-diver companion can stay at the surface to snorkel. And if they don’t fancy the boat, they can always stay on the island and enjoy the beach with most local islands having now reserved portions of their beaches for guests, so that they can sunbathe in bikinis. Staying in a local island has a lot advantages. It’s much cheaper and there are some great accommodation choices. A much larger portion of your budget can go on diving, which is always a plus. But travellers should not expect the same experience as being on a resort. On a local island, guests are expected to live amongst the islanders and respect cultural norms, covering from shoulders to knees when away from the beach. As mentioned there’s no booze – but then if you’re diving you should be restricting that anyway. Food is more limited but still delicious – think lots of fresh fish, barbecues and coconut water. So if you’re looking to experience the real Maldives, away from the glitz of the resorts, to discover the warmth of local hospitality and a way of life that has changed little for centuries, a local island is a great place to start.